Using a dedicated videocamera to record videos is becoming less and less popular. Besides some professionals and the occasional user that still think it is still 1995, most of people use their smartphone or, if you need better quality, a photo camera to record video. The video capabilities of DSLR’s and mirrorless cameras have improved greatly over the last few years. Most cameras can film in Full HD resolution, and some models even film in 4K resolution. The only thing that hasn’t improved that much is the audio. Some high(er) end models do have a stereo microphone. But those are built for omnidirectional recording. And because those microphones are built in to the camera body they also record the sound of using the buttons and dials on the camera. The omnidirectional recording also makes them less suited for recording in an environment with a lot of background noise. If you want to improve the sound of your camera an external microphone is a great option. External microphones are available in various types, all with their own intended use. In this review I’ll tell you more about two (mid-range) directional mono microphones, that are best for recording speech: the Hähnel MK200 and the MyMyke SmartMyke. The Hähnel costs about 190 euros, the MyMyke is a little over 200 euros. 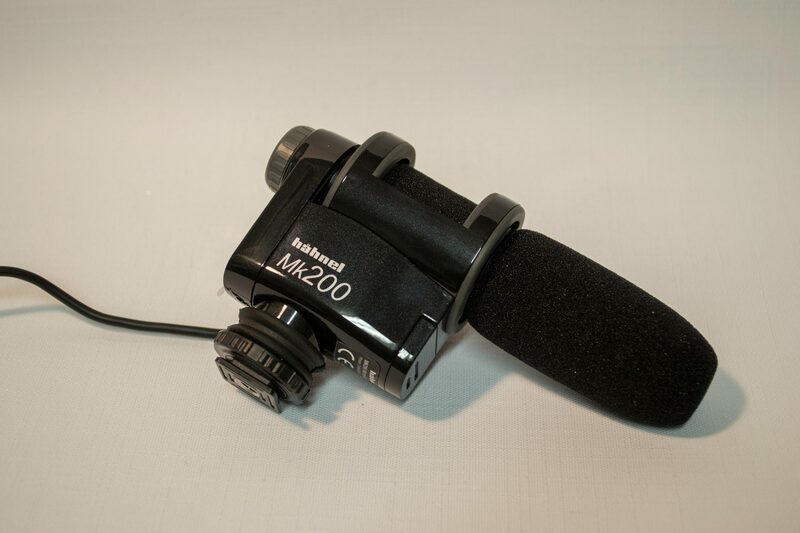 The Hähnel MK200 is a compact directional microphone that is shipped quite complete. Besides the microphone the set consists of a set of batteries and a wind-sock. 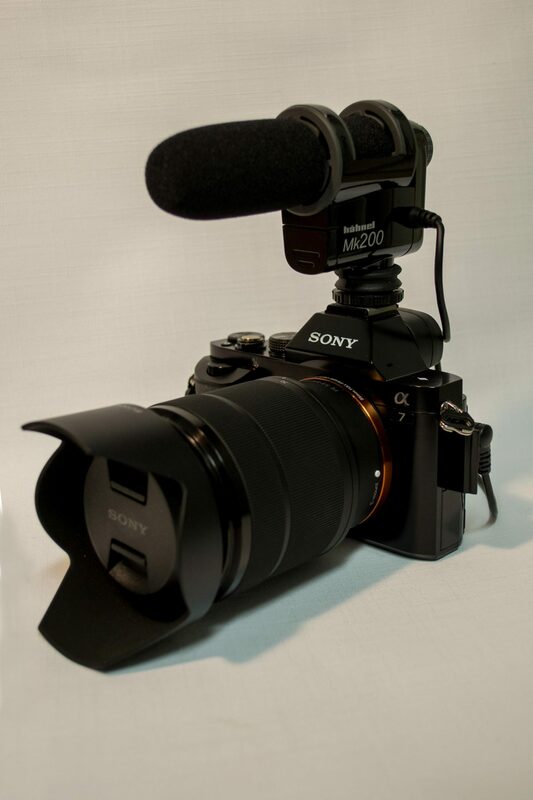 The microphone has got a hotshoe mount to attach the microphone to your camera. 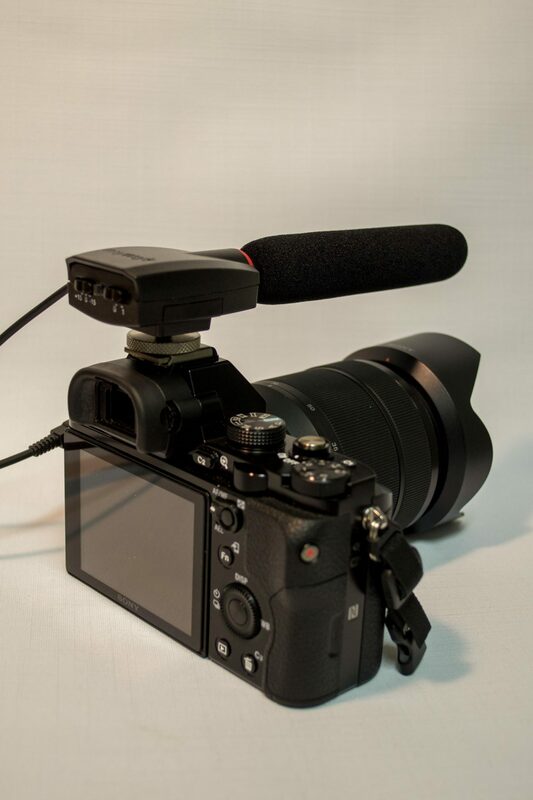 The mount has got a rubber ring to dampen sounds of the camera and prevent vibrations from interfering with your recording. On the bottom of the hotshoe you’ll also find a tripod mount so you can mount the microphone to a tripod. The batteries are placed in a compartment under the microphone. Hähnel says you can record about 100 hours on one set of batteries. On the back of the microphone you’ll find the on-off switch, that has got enough resistance to prevent it from switching unwanted. Under the on-off switch is a small LED that shows if the microphone is on and if the batteries are low. It also shows if the recorded audio is too loud. Above the on-off switch there is a round dial that a switches between normal operating mode and the +10db and -10db mode. The lead is long enough for use on most cameras. The SmartMyke is a little smaller than the MK200. The base of the microphone has got a compact and flat design, the mic itself is quite long. 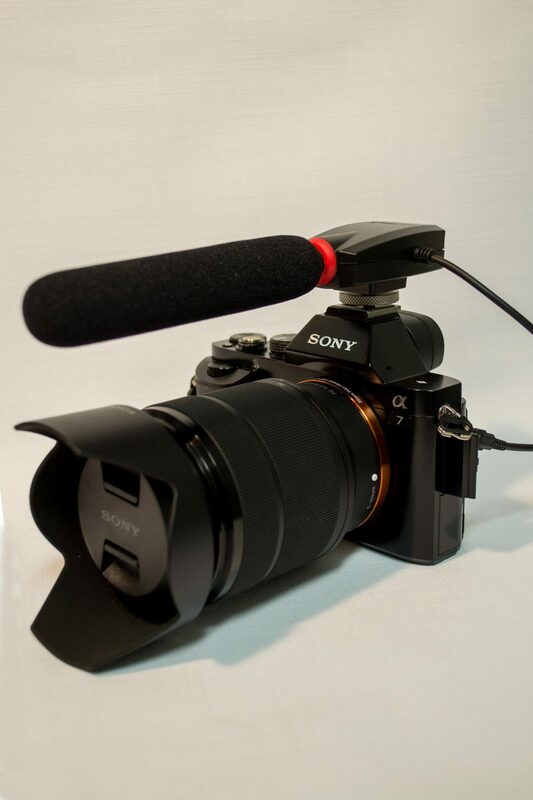 Because of the flat design the microphone is quite close to the camera, so it doesn’t feel big mounted on the camera. The downside of being close to the camera is that the microphone picks up more sounds of the camera buttons and dials and the lens. The SmartMyke is powered by a single CR2032 battery. Despite the small size of the battery MyMyke recons you could record for about 200 hours on one battery, so the integrated hardware has to be very energy efficient. The SmartMyke has got a stainless steel hotshoe. It feels sturdy and high-end but isn’t dampened by a rubber ring like the MK200. MyMyke has put the damper in the microphone itself. On the back of the mic you’ll find two buttons, one to activate the microphone and the other one to switch between the normal operating mode and the +15db and -15db setting. Between the switches there is one LED that shows if the mic is on. It doesn’t have any other functions like the LED of the MK200. The SmartMike has got a nice curly lead, which means it is easy to keep it out of the way when you have it attached to the camera. Both microphones are easy to use. You mount the microphone on you camera, plug in the 3.5 inch jack, turn the microphone on and you’re good to go. In most situations the ‘normal’ operation mode will do, in very loud or quite situations you can adjust the recording level. The steps between the recoding levels on the MK200 are a little smaller than the ones on the SmartMyke. I can’t really say which is better, just that both microphones seem to work quite well in most situations. Both microphones have dual channel mono output. To test the microphones I’ve built a small test-setup. That way I could test both microphones under the same conditions and compare them to the built in microphone of my Sony A7. In my test-setup the microphone is about 2.5 meters (roughly 8 feet) away from the laptop with two external speakers. The laptop plays a Youtube clip from Lowepro in which they present their ProTactic Backpack (https://youtu.be/fV9vd_uGnSg). To test the directional capabilities of the microphones I’ve setup a second computer on the left of the camera with two external speakers. That computers plays the Youtube clip ‘Bar crowd 9H’ (https://youtu.be/Bh6W4yEX7fQ) on the same volume as the Lowepro presentation. One of the two speakers is pointed directly at the side of the camera (and microphones) and the second one is pointed at the wall to diffuse the sound. In the following video I’ve recorded the Lowepro presentation with the internal microphone of the A7 and the two microphones. I didn’t use any software to alter the sound in the clips, so the sound is straight out of the camera. The built in stereo microphone of the Sony A7 does quite well in this test, but the background noise is quite loud, making the presentation hard to hear. The MK200 does a lot better. You can hear the voice in the presentation better and background noise seems to be muted. The MyMyke does a little better than the built in microphone, but it is clearly less capable than the Hähnel MK200. Background noise is louder with the MyMyke than it is with the MK200. So the Hähnel manages to bring out the voice better than the MyMyke does. In the second clip you can hear how much of the sound of using the buttons and dials and zooming the lens is recorded by the microphones. In the clip I use some of the buttons and the control dials on the front and the back of the camera. I also zoom the lens in and out. With the internal microphone of the Sony A7 you can clearly hear me using the dials and buttons, you can hear me zooming the lens in and out but it isn’t very loud. You do hear me slamming the lens in to the hard stop at the end of the zoomrange. The Hähnel MK200 filters out the sound of zooming the lens almost completely. You can still hear it when I use the dials, but it is dampened very well. The MyMyke performs about the same the internal microphone. The dials sound quite loud using the MyMyke, and you can clearly hear a grinding sound of zooming the lens. This is probably because the microphone is quite close to the body of the camera and lens due to the compact and low profile design. 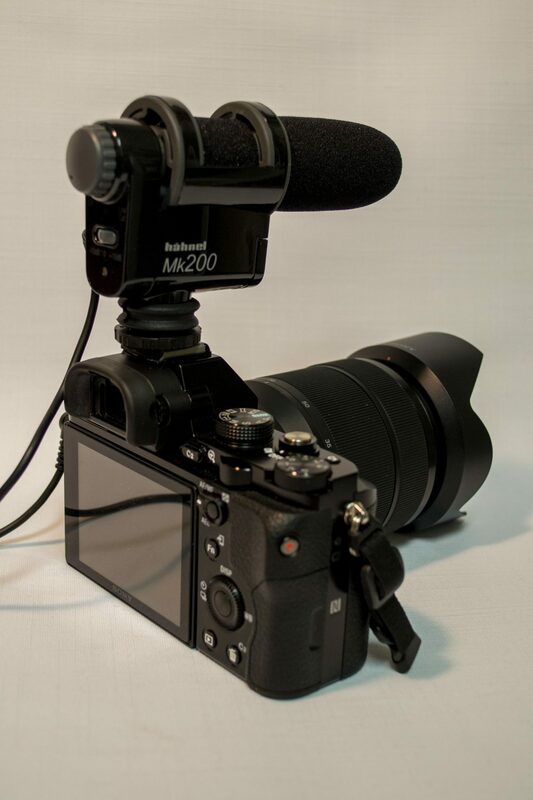 For improving the audio quality when using a DSLR or mirrorless camera using an external microphone is a very good option. You do have to choose the right tool for the job. 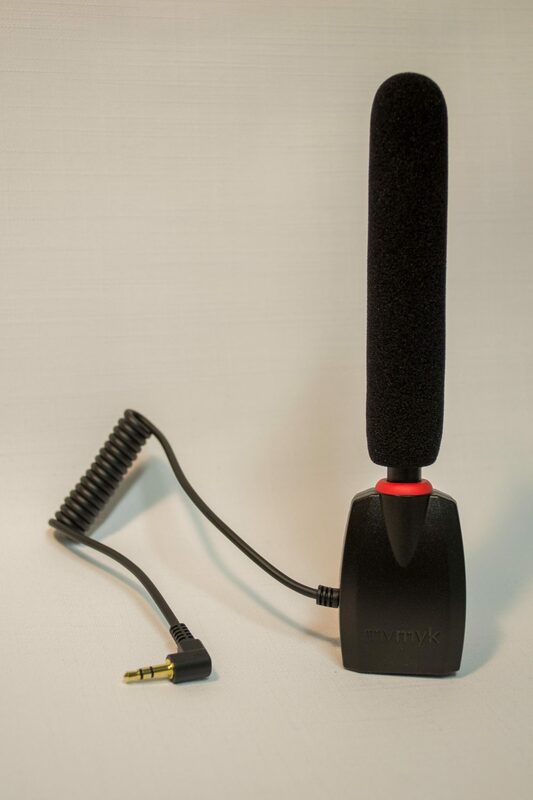 A directional mono microphone like the Mk200 and MyMyke are very good for recording voices in a loud environment, but are less suitable for recording (live) music. Both the MK200 and the MyMyke are easy to use, well built and compact. The MyMyke is made using higher end materials (like the stainless steel mount), and is a little smaller / more compact. It is also a little more expensive. The MK200 is less expensive and also offers better performance. It dampens background noise better and makes voices sound more clear than the MyMyke does. And since that is what an external microphone is all about the Hähnel MK200 is the clear winner of this test.